Facebook Home isn't doing so bad, what about the HTC First? AT&T will discontinue sales of the HTC First, sending all remaining stock back to HTC, due to extremely poor sales of the Facebook Home-packing device, a report this morning claimed. As of last week, the HTC First sold just 15,000 since its debut on April 12, according to BGR. Last week is when AT&T slashed the HTC First's price to just $.99 (UK£.64, AU$.97) with a two-year contract. According to the site's sources, that price cut is just a final effort on AT&T's part to ditch as many of the devices as possible before shipping the rest back to HTC once a contract between AT&T and HTC for in-store displays expires. The HTC First is the only phone to come pre-loaded with Facebook's Android UI overlay Facebook Home. 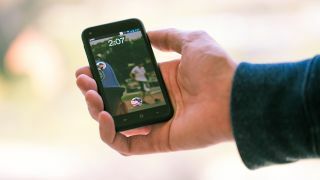 The ill-fated HTC device was unveiled on stage by Facebook CEO Mark Zuckerberg in early April. Facebook Home itself hit 1 million downloads over the weekend, though its score sits at a miserable two stars. Neither HTC nor AT&T will discuss the HTC First's sales performance, though an AT&T store sales representative told TechRadar last week that "people don't seem to want that phone as much." We asked both companies to comment on this latest report today. AT&T informed us that they "don't comment on the results of individual manufacturer device sales," and HTC said it doesn't release sales data outside of their official financial announcements.